A smooth blend of tomatoes with a hint of sweetness that’s a true classic. ¼ cup of vegetables per serving. No artificial colours or flavours. Featuring just 480mg of Sodium per 8oz. serving. Vegetarian. DIRECTIONS NOTE: Product MUST reach a minimum of 82°C (180°F) measured with a thermometer for 2 minutes by all cook methods given below. Stir before serving.KETTLE COOKER / STEAM TABLE: Gradually whisk contents of package in 4 litres water. Cover container. Set unit on HIGH and cook for 30 minutes. See NOTE above.STOVE TOP: In a suitable container, gradually whisk contents in 4 litres of water. Bring to a boil. Cover and simmer for 10 minutes. Stir occasionally. See NOTE above.CONVECTION OVEN: In a suitable container, gradually whisk contents in 4 litres of water. Cover container. Set oven temperature to 176°C (350°F) and cook for 30 minutes. See NOTE above. Garnish with croutons and shaved Parmesan Cheese for mouthwatering appeal. 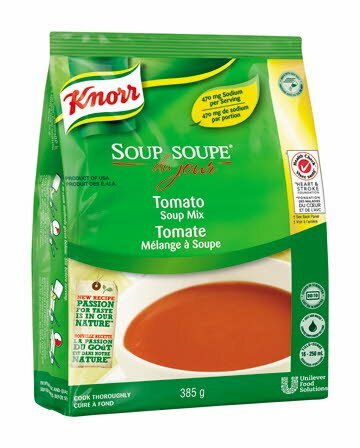 Combinations are endless with this classic flavour, and your choice of protein, herbs, vegetables, for a signature soup.